Jamal Khashoggi was about to disclose details of Saudi Arabia’s use of chemical weapons in Yemen when he was killed. Saudi Arabia told the U.K. about their plan of abducting Khashoggi three weeks before the incident took place. The MI6 warned them against carrying out the said operation. The murdered journalist Jamal Khashoggi was about to disclose details of Saudi Arabia’s use of chemical weapons in Yemen when he was killed, as reported by the Sunday Express, a source close to him told the media outlet Friday. This revelation was made as different intelligence sources disclosed that the U.K. was made aware of the entire plot by Saudi Arabia three weeks before the incident took place on Oct. 2. Intercepts by GCHQ of internal communications by the kingdom’s General Intelligence Directorate revealed orders by a “member of the royal circle” to abduct the troublesome journalist and take him back to Saudi Arabia. The report does not confirm or deny whether the order came from the Crown Prince Mohammed bin Salman. They were supposed to abduct Khashoggi and take him back to Riyadh but could take other actions, if the journalist created problems. “We were initially made aware that something was going in the first week of September, around three weeks before Mr. Khashoggi walked into the consulate on October 2, though it took more time for other details to emerge,” the intelligence source told the Sunday Express Friday. The MI6 had warned their Saudi counterparts to cancel the mission. “On October 1 we became aware of the movement of a group, which included members of Ri’āsat Al-Istikhbārāt Al-‘Āmah (GID) to Istanbul, and it was pretty clear what their aim was. Sunday Express also obtained an anonymous interview from a close friend of Khashoggi’s who revealed that the journalist was about to obtain “documentary evidence” of Saudi Arabia’s use of chemical weapon in its proxy war in Yemen. Iran has previously claimed that the kingdom had been supplying ingredients that can be used to make the nerve agent Sarin in Yemen but Khashoggi was possibly referring to phosphorus which can be used to burn bones. Last month it was claimed that Saudi Arabia had been using U.S.-supplied white phosphorus munitions against troops and even civilians in Yemen. Jamal Khashoggi was a Washington Post columnist who left Saudi Arabia a year ago due to the widespread crackdown on dissent by the crown prince which saw imprisoning of a large number of dissenters and activists in Saudi Arabia. The journalist went to Saudi consulate in Istanbul on Oct. 2 .to get papers for his marriage and never seen after that. Turkey maintained that he was killed inside the consulate by Saudi authorities but the latter denied any allegations against them for almost three weeks before finally accepting that he indeed was murdered but alleged it to be a rogue operation about which the crown prince had no knowledge. The case of Khashoggi created an international uproar and diplomatic scandals where many countries are deciding to impose sanctions on the country and many companies severed their ties with Saudi Arabia. 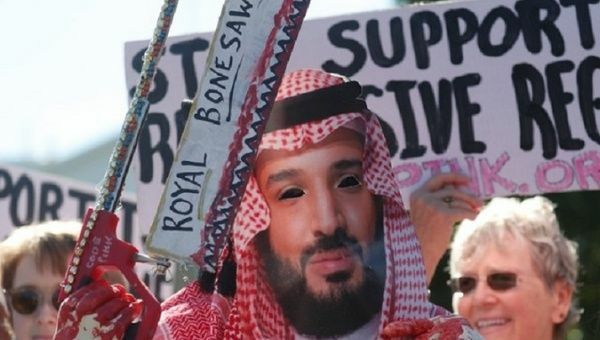 According to the latest updates, the European Union is considering a ban on arms sale to Saudi Arabia and other sanctions. The EU will make a joint decision on how to punish the kingdom, Germany’s Chancellor Angela Merkel said Saturday in Istanbul after Russia-Turkey-France-Germany summit on Syria. A similar sentiment was expressed by France’s Emmanuel Macron.